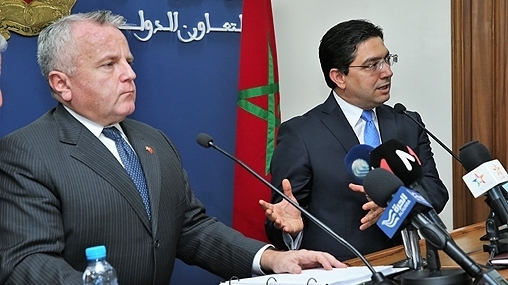 The visit made by US Deputy Secretary of State John J. Sullivan on Friday to Morocco within the frame of a regional tour was an opportunity for the US government to reiterate its stand regarding the Sahara issue. During this trip, Sullivan met Moroccan Foreign Minister Nasser Bourita and “expressed US interest in advancing UN-led efforts to find a peaceful, sustainable, and mutually acceptable political solution” to the Sahara issue, says a press release issued by the State Department. He also described Morocco’s autonomy plan as “serious, realistic and credible”, saying it “represents one potential approach” that could satisfy the aspirations of the Sahara people to run their own affairs in peace and dignity. Besides the Sahara issue, Deputy Secretary Sullivan and Foreign Minister Bourita discussed a wide range of political, economic, and security issues, including advancing regional stability, expanding bilateral trade opportunities, and promoting ongoing initiatives on religious tolerance. The two also discussed continuing bilateral dialogue and cooperative efforts, including meetings this year of the Strategic Energy Working Group and the Defense Consultative Committee. The Deputy Secretary of State thanked the Moroccan government for its important role in countering terrorism and violent extremism. He also thanked the North African Kingdom for co-hosting this week, a coordination meeting of the Global Counterterrorism Forum’s Initiative to Address Homegrown Terrorism and a political directors’ meeting of the Global Coalition to Defeat ISIS. Sullivan and Bourita also discussed opportunities to strengthen trade and investment ties between the United States and Morocco, building on the bilateral Free Trade Agreement. The Deputy Secretary also met with Head of Moroccan Government Saadeddine El Othmani. Talks focused on Morocco-US long-standing friendship and ways to improve strategic cooperation, particularly in the areas of trade and investment, regional security, and counter-terror priorities. Written by: Jaber Ali on June 30, 2018. Posted by Jaber Ali on Jun 30 2018. Filed under Headlines, World News. You can follow any responses to this entry through the RSS 2.0. Both comments and pings are currently closed.